There is very little tourist traffic on the prestige trekking routes in Bhutan. One has a very pleasant sensation of breathing fresh ground on treks in Bhutan. The Chomolhari trek follows the crystal clear trout rich upstream trail of Paro Chu, along the verdant rhododendron canopied forests and salubrious green alpine meadows. Mt. 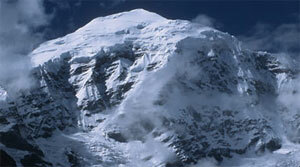 Chomolhari stands at a magnificent 7,314 m, with age old frontier forts and sprawling yak pastures in its foreground. Day 1: Arrival at Paro. Druk Air, Drive to Thimphu, Hotel Wangchuk/Druk/Taktsang. Day 2. Thimphu: Early morning, hike to view Cheri monastery with pack lunch; Afternoon visits to the Thimphu General Post Office; School of Thanka Painting and Mask Making; Traditional crafts in silver and gold; hotel. Day 3. Thimphu: Morning visits to the Kings Memorial Chorten; the handmade Paper Factory and the Archery Grounds where Bhutan's national sport of Archery can be witnessed. Afternoon visit the local Handicrafts Center and the Traditional Medicine Hospital; stroll in the capital town of Thimphu, Hotel. Day 4. THIMPHU/PARO, DRIVE AND BEGIN CHOMOLHARI TREK. Paro - Shana :Drive upto Drugyel Dzong where the road ends and thetrek begins, following the river gently uphill through a narrowing agriculture valley. Initially you will pass through the serene pastoral life of the villages with their dogs and children playing in the fields. Camp is just beyond an army post. Alt.2800m,. Distance - 17 Kms about 5 - 6 hours. Day 5. Shana - Soi Thangthangkha: Continue uphill through the river valley. It narrows and closes in and the trail winds up and down alongthe drianage. Camp out in the meadow with the starry sky above you. Distance is about 21 Kms, 7 - 8 hours. Day 6. Soi Thangthangkha - Jangothang: The trail climbs up the Pa Chu pass a small army post where the valley begins to widen out. Views of high ridges and snow-capped peaks are seen all around, and close by are yaks and yak-herders camps. Lunch will probably be at one of these camps beneath a ruined fortress at the base of Chomolhari. Alt. 4040 m Distance - 19 Kms, about 5 - 6 hours. Day 7. Jangothang - Lingshi: Open yak pastures on the way up and down the pass.Quite possibly still some people in their yak tents depending on the time of the year that you are there. Great views of Lingshi Dzong as you come down into the.Lingshi basin if the weather is clear. Tserim Kang and its descending glaciers at the north end of the valley. Alt. 4150 m. Distance - 19 Kms about 5-6 hrs. Day 8. Lingshi - Shodu: The trail today climbs to the Yalila pass (alt. 4820m), from where on a clear day- impressive views of Mount Chomolhari, Tserim Kang and Masagang can be seen. Alt. 3963 m. Distance - 22 Kms about 7 - 8 hrs. Day 9. Shodu - Barshong: Follow the Thim-Chu through a forest of Rhododendrons with water falls; the path at first narrows and closes, then winds up and down along the drainage, eventually climbing up to the ruins of Barshong Dzong.Camp just below the ruined fortress. Alt.3785m, Distance - 13 Kms about 3 - 4 hours. Day 10. Barshong - Dolam Kencho: The trail descends to meet the Thim-Chu river following gradually through the forest of Rhododendrons, and then ascending upto the pasture land. Camp in a meadow at Alt.3628m, Distance - 11 Kms about 3 - 4 hours. Day 11.Dolam Kencho - Thimphu: Continue up-hill through the forest to a small pass. The trail undulates along the drainage. The rare golden langour can be seen among other wild monkey species. Your pick-up transport will be waiting at Dodina- to jolt you back to the 20th century. Distance- 14 Kms about 4 - 5 hours.Overnight at Hotel. Day 12. Thimphu - Punakha: Drive east to Punakha and Wangdi valley. Visit the Punakha Dzong- winter home to the state monks. Overnight at the Hotel Zangdopelri. Day 13. Punakha/Thimphu/Paro: Early morning drive over the 10,000 ft pass of Dochula to view the stunning scenery of the Himalayan ranges; descend to Thimphu for lunch and continue to Paro, hotel Gangtey Palace. In Paro: sightseeing includes a visit to the northern part of the valley to Drukgyel Dzong ruins (Monastery Fortress) that once was a strategic post to withhold invading Tibetan forces from the north; visit the famous Kyichu Lhakhang- one of 108 sacred Lhakhangs built by the Buddhist King Srongtsen Gampo of Tibet. Visit the district Dzong called Rinpung Dzong; hotel. Day 14. Paro/Departure: Early mornning hike up to the Tiger's Nest known as Taktsang--one of the most spectacular and most sacred pilgrim sites to all Buddhists. One of the great founders of Tantric Buddhism- Guru Padmasambhava is known to have flown on a tigress to meditate on the cliffs--the tigress being his consort the divine Yeshe Tsogyel; return to hotel. Day 15. Flight out Paro/BKK/Del etc. Drive to Paro Airport for onward journey. Climate (general): days are normally warm 15-25 deg Celsius; nights are cool at about 5-10 deg; altitudes range from 3000- 4200 meters. medium fitness is necessary to enjoy this trek.